According to author Chris Baréz-Brown, when U2 singer and inveterate activist Bono first approaches a new organization, he wants to know who the group's "Elvis" is: who's the charismatic get-it-done person. This new book is devoted to bringing out your inner Elvis, or at least upping your Elvis quotient. Is your job like wading through quicksand? Do you want to quit every time the printer jams? Or do you love it and want to shine even brighter? Either way you're not alone. We've put together some simple questions to help you see how shiny your working life could be. Spend a couple of minutes giving us your answers and we'll give you a personalized action plan with some easy steps to get you a bit closer to loving every minute of the working day. And one more interview (below). Credibility: How Leaders Gain and Lose It, Why People Demand It. James M. Kouzes, Barry Z. Posner. Wiley. 368 pages. I've worked for some interesting characters. Not my current or recent bosses, naturally, who are exemplary people, but in the past, I've dealt with a number of folks who may have been managers — they owned the title and occupied the office — though they clearly weren't leaders. Their authority came from power and position rather than from their leadership or actions. Some, I respected, but they didn't necessarily earn it from their work, just their titles, unfortunately. They were the boss. Their words were one thing but their behavior was something else entirely. It's one thing to tell everyone that this next project is a life-and-death matter, but it's another matter entirely when everyone is still at work past closing time, and the boss is heading out the door. You've seen that movie, too, I'm sure! Kouzes and Posner's new book, a revision of their popular earlier edition, presents a wise and honest look at the basic qualities that leaders must possess. In aggregate, they can be described as "credibility." Credibility, because there's an honesty and authenticity that's required. To be taken seriously, they write, it's insufficient to simply say all the appropriate things; the words and thoughts must align and be put into action on a consistent basis. Most of us have an innate sense of what's real, and inauthenticity and lack of commitment are generally pretty obvious — palpable, even. But if it's all so obvious, what need is there for a book? And why would it benefit from being revised and brought up to date? Kouzes and Posner conducted a ton of interviews and present various examples and aspects of credibility in a very readable and comprehensible manner. The numerous anecdotes and case studies are quite relatable, too. The stories herein do a fine job of providing real-life situations to reflect upon and project one's own situations on, too. Real leadership requires an arsenal of resources but you can't fake credibility; cracks show up sooner or later. But Kouzes and Posner provide a nice reality check for those whose authenticity might be lacking. The challenge, as always, is in getting them to recognize and act upon it. 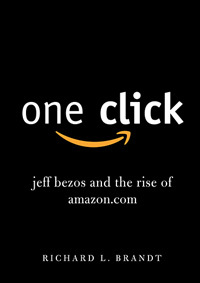 One Click: Jeff Bezos and the Rise of Amazon.com. Richard L. Brandt. Portfolio/Penguin. 208 pages. But I had no idea I was supposed to just read and “report” on only one book, so I checked out three titles from my great little school library, and read about those pioneering aviators from three different authors’ angles. Why not? I thought my debut book review, er, report, was a great success, except the teacher wrote TITLE? AUTHOR? in big red letters across the top of my 3-hole notebook paper I’d penciled my report on, and she later informed me that I was supposed to “report” on only one book, not several. This new bio of Amazon.com’s Jeff Bezos is a fun read. Serious but not heavy or ponderous, its author does a fine job chronicling the life of the guy who essentially fulfilled the promise of the Internet as a medium for commerce. Bezos was preternaturally bright and ambitious, one of those driven kids who loved computers and excelled at all sorts of techy things. But he also spent childhood vacations on his grandfather’s Texas ranch, learning to do a slew of decidedly low-tech chores with cattle, such as cleaning stalls, branding (insert joke here! ), castrating and other fun stuff. He never knew his biological father, who‘d divorced his mom when he was a year and a half old, but she soon remarried and they both took the name Bezos from his adopted dad, a Cuban refugee. The family first lived in Albuquerque, New Mexico, then Houston, Texas, then Panama City and Miami, Florida. He attended Palmetto Senior High in Pinecrest, had a summer job at McDonald’s, and enjoyed a happy childhood and adolescence. After high school, Bezos started a little company with another Palmetto High graduate, aimed at tutoring advanced fifth-graders and was written up in the Miami Herald. Bezos also received a science prize in the newspaper’s prestigious Silver Knight competition. After obtaining a degree in computers and electrical engineering at Princeton, Bezos was a highly sought-after recruit. Spurning several impressive offers, he chose a start-up headed by Columbia professors trying to build “a mini-Internet” for Wall Street investors, a full decade before the real Internet came into popular use. Despite enjoying rapid success in the new company, he yearned for his own enterprise and methodically searched for a business to launch on the World Wide Web. After deciding upon bookselling, he applied himself fanatically to his baby, Amazon.com. Brandt does a good job of weaving an upbeat and appealing narrative thread, making Bezos’ life and quest interesting and compelling. It’s not a lofty literary work, but an example of good long-form journalism. There are numerous interviews with key sources and though Bezos himself may not have provided the author with his own one-on-one, he’s spoken to the media enough times to generate a pool of quotes for Brandt to draw from, as needed. Perhaps without intending to, Brandt presents a story that’s a classic American tale of tenacity and enterprise. Though not poor, Bezos’ journey, in its own way, is as inspiring as other archetypical American business and creative pioneers’ struggles. And like the Wright Brothers, might encourage other young entrepreneurs — or even nascent book reviewers. A book about Amazon.com, a change agent for how we buy not only books but various other products too, is of timely interest. This book, One Click, is well done and gives you the background into Amazon.com and how the true entrepreneur, Jeff Bezos, did it and made it such a massive change agent. All it took was just one entrepreneur who recognized the impact that the Internet will have on consumers; that software has to be developed to make it easy for the customer to buy with just one click; and the attention to detail the site has to provide so the customer trusts this method of buying. Beyond the technical, the book also spotlights the tenacity an entrepreneur needs to stick with it even when the so-called experts disapprove, and the insight needed to pick the right product to kick start this major change in buying, in this case, books. As I have just this month published a book, Power Plug-In, all about energy sources and how to invest in them, much of One Click hit home to me. It is a 'must read' for everyone for information on how the world is changing and how past business practices might not be of use any more. A fantastic biography of Jeff Bezos (amazon.com). A man that should be in the class with Steve Job and Bill Gates. Technically he can compete with both of them and after his scientific schooling he worked in the financial field. Any other person would have been satisfied with the position that he held and the money he was making, but he had a dream of being an entrepreneur. He did research into every type of business and finally settled on selling books as the best way to build an empire. Jeff Bezos spent time taking a class on operating a book store and visited many book stores. He figured that selling books on line, with the vast number that he could inventory on the internet, would be a successful venture. The story goes on to detail all of the things that he did. In particular how he raised money to start his business. Unfortunately it took many years to begin making a profit, but his financial backing stayed with him (he was a terrific sales person). He developed the "one click" technique of ordering and had a monopoly on that patent. He developed all of the warehousing, shipping, ordering, controlling, etc. methods. He hired and fired people (some very intelligent people) like it was a fast food operation. He eventually got the best talent to work for him and built a very successful empire. ONE CLICK was a bit disappointing. I love Amazon, and thought this book would give an insider's view of how the company was born and grew. Based on the cover of the book, one would think this was a book about Amazon. But I guess you can't judge a book by its cover. The book seems to be more of a compilation of news articles over the past 10 years. Very little of what was in the book was new information that I already didn't know. As far as the book being a biography about Jeff Bezos, it is lacking in that respect as well. If the book would have been well written and insightful on Jeff Bezos the same way the STEVE JOBS biography by Walter Isaacson was, then it would have been a hit. The problem is that this isn't really a biography on Jeff Bezos either. This book is stuck somewhere halfway between a book about Amazon and a book about Jeff Bezos. Unfortunately, it is very shallow on both of those subjects. It lacks the appropriate amount a depth that should be given to each. As far as the format of the book, the small size is easy to carry around with you to read. It does however get a bit difficult to read about halfway through the book because the page size is small, margins are small, and typeface is small. I don't know if this book really knows what it wants to be. When I saw the size of the book, it made me think it could be no more than a cursory look at Bezos and Amazon and, in many instances, it is. It is not a biography. It is not a company history, per se. Overall, it is a moderately well-researched, passable overview (especially of the early years) of Jeff Bezos and Amazon.com. It felt throughout as if the author could not bring himself to be any more than begrudgingly complimentary of Bezos, his business and entrepreneurial acumen, and his management style. The sucess of Amazon and Bezos's other ventures seem to grate on Brandt, as if he keeps searching for dirt but can't find exactly what he wants. Ultimately, it appears Brandt is unable to decide whether Bezos is a genius or a ruthless businessman willing to kill his own creator to get ahead. Why can't he be both? I was so excited to be reading about my favorite shopping site, Amazon. Then the book arrived and it was so cute and compact. I thought, "This will be great, a quick read, hold my attention..." As tiny as it is, it could be tinier. This story could be told over coffee, not a five course dinner! Richard L Brandt has written a fantastic chronology of the phenomenon of on-line marketing as epitomized by the archetypal leader, Jeff Bezos, the founder of Amazon.com. For anybody interested in the delivery of knowledge, Bezos’s innovations, which he applied in the 1990’s, cannot be diminished. Ideas like reader’s reviews, the marketing of a used-copies network, and technological developments like self publishing, are to his credit. His contributions are a crucial piece of the puzzle, when we wonder what happened to Borders. Besides retelling how the visionary accommodated and incorporated publishers and the associate suppliers; this small book includes a discussion of the marketing and a customer service philosophy, a way of growing an original idea, in spite of the corporate competition from the giant bookstores. There are lessons here about the venture capitalists, the ways of start-ups, and it is fascinating to see how Bezos’s intelligent team promoted online ordering through this process. He originated the idea of customer feedback linkages, “others who purchased this book, also liked” and thereby created individualized demand, even while selling at a loss. Here was a new way of feeding publisher content, that revolutionized the delivery of books, which others could only imitate. In the later chapters the author discusses the expansion of the Amazon trademark to other goods, clothes, industrial products and sports gear. In the last chapter there is a very interesting account of his strategy to make the Kindle, the trend setting eReader, a new delivery method of knowledge. I think it is worth the cost of the downloadable that yes, you can even get at the Miami Public library now, and then buy it if you like it. SO many good lessons here about marketing to consumers. The jury is still out as to how the eBooks will impact formal education, with their cost savings and capacity for international knowledge exchange. But Jeff Bezos, the leader of this open-knowledge revolution, may get credit for having encouraged reading original sources again, including newspapers, and reclaiming access to full content, while giving customers what they want. And this quasi-history does him justice. The literary world is more accessible today than ever before and getting bigger. Thanks to Jeff Bezos’s inventions, his Kindle, his network and his modification of the book supply chain while retaining individuality; now great literature and some not so great literature is accessible like never before. Read this book and think about the impact of all the other markets of personal items, ideas and services, which Amazon has made possible. I finished reach One Click. Before reading this book I had some knowledge of the history of Amazon and of Jeff Bezos himself. This book definitely shed more light on how it all started and how much of a genius Jeff really is. I was certainly impressed by his hard decision to leave his high paying Wall Street job to follow his dream, this is something not many of us have the testicular fortitude to do. The philosophy of Silicon Valley start-ups is quite interesting: the hire the best people, which are those who don't know that something "can't be done," and therefore will figure out how to do it. I wish many other industries would apply this philosophy when they put together their teams. They hire people with tons of experience but who are also boggled down by conventional thinking, which in many cases prevents them from thinking outside the box and finding truly innovative solutions. When analyzing decisions from now on I will forever remember Jeff's "regret minimization framework." Which decision would he regret more if he made either one? It's a nerdy way of looking at it but it totally works for me. At first glance "One Click" seemed like just another book about some nerdy guy that started an Internet business and got lucky when it took off. The more I read, the more interested I became in Amazon founder, Jeff Bezos. The story that best illustrates his quirkiness and strategic approach to life was the criteria he used to select a mate: "She has to be someone who is resourceful enough to get me out of a third-world prison." That says more about him and his values than anything else in the book.